Made in Portugal. Crystal clear contemporary decanter/carafe. In excellent condition. Beautiful blue crystal with clear stems hand blown aperitif glasses by Sasaki of Japan in excellent condition. 4 3/4" tall, 1 5/8" across top. You will receive the item(s) as shown in the photos. SIZE IS 41/4". IN GREAT CONDITION. ~The Chic Shed~. I am very easy to work with! International priority rates apply. Pair 2 Galway Longford Wine Water Goblet Glass Cut Crystal Stemware Ireland. Condition is Used. Shipped with USPS Priority Mail. 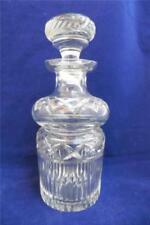 The decanter and stopper have a cut diamond pattern and ribbed design. NOTE : the decanter has a small scratch near the bottom and a fine line of clouding near the bottom on one side. The clouding is easily removed with a denture tab. 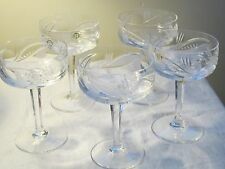 Gorgeous set of 6 pieces of MCM Crystal. Rosenthal Linear Smoke Water Goblet or Wine Glass. Clear Bowl, Smoke Stem, Square Base. Clean, straight lines. Excellent condition except for 1 has a very tiny chip on the corner. Criss-cross and fan cut design. Rare and hard to find. Condition is Used, in excellent condition. 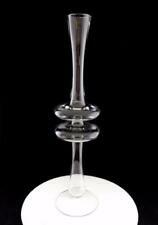 Set of 2 Unique Milano Crystal Wine Glasses. Can be used for Water, Wine, Sangria or any Beverage. Made in Romania and Feature a Cobalt Blue Line Swirl pattern with a Hand Painted Stained Glass Applique of Red, Blue, Yellow and 24k Gold Accents. TRADEMARK ETCHED AT BASE WITH SIGNATURE BUBBLE. IT HAS BEEN IN OUR FAMILY AT LEAST 15 YEARS IF NOT MORE. IT WAS A GIFT. NEVER USED. INSIDE THE LIP IS A 1/8" CHIP FROM PROBABLY THE CLEANING PERSON TAKING IT OFF AND ON. CONDITION : Decanter and 4 wine glasses excellent unused condition. 2 MILANO Romanian Crystal Goblets, wine glasses. Glass Hand Blown hand painted gold rose. Condition is Used, some pealing of gold paint, some scratches, no markings. 8.5 " tall. I am a dedicated picker! Expertly Cut and a Wonderful Centerpiece or Gift. Beautiful hand cut, hand blown full lead crystal rose bowl/vase by Astral. Use as a rose bowl, vase or beautiful on it's own as a decor item. Made in Korea. Gorgeous cut floral pattern on all sides. Set of 7 mouth blown purple crystal glass goblets by Noritake in the "Novus" pattern. Nice weight and ring to the glass. I am no expert and research each piece the best I can. EUC Vtg. 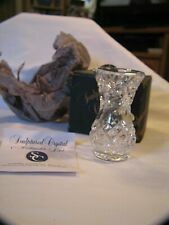 BLOCK Hand Crafted 8 Inch 24% Lead Crystal w Frosted Tulip vase In Box. Was a wedding gift. Never used. Box shows a little wear. Signed Val St Lambert. Signed Val St Lambert in script. Etched Scorpion. Lidded Jewelry Trinket Box. The beveled lid graced with an etched scorpion in the center. Belgium Crystal. We are located in the Fort Lauderdale Area. 8 Beautiful Green with clear Stems. Excellent Condition. This is a Gorham crystal rose bowl in the Bamberg Pattern. Crystal rose bowl has an elegant cut crystal in a circular optic motif. BAMBERG Pattern, Signed on the bottom. Gorham Lead Cut. Crystal Glass Rose Bowl 4.5". 1 (One) Riedel Tyrol Viognier/Chardonnay Glasses. Tyrol is executed in lead crystal which gives to the solid base a never-ending sparkle and great stability. The low height allows the glass to be enjoyed daily because of easy dishwashing. Aegean Frost Champagne Toasting Flute Set Of 2. 11" Tall with Frosted Stems. I am a dedicated picker! 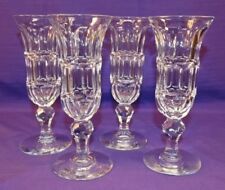 Ralph Lauren BROGAN CLASSIC PAIR of Highball Cocktail Glasses Cut Crystal NEW! The luxurious BROGAN highball glasses are crafted from exquisite lead crystal. BROGAN CLASSIC. Highball Crystal Glasses. Ralph Lauren. New in original Ralph Lauren Box. 24% lead crystal. ~Set of 2~. 5 out of 5 stars - Ralph Lauren BROGAN CLASSIC PAIR of Highball Cocktail Glasses Cut Crystal NEW! 1 product rating1 product ratings - Ralph Lauren BROGAN CLASSIC PAIR of Highball Cocktail Glasses Cut Crystal NEW! 1 glass in the Papyrus design, green base clear bowl. 9 5/8” tall 3 1/8” across bowl. As this is hand blown glass, an occasional slight variation or tiny bubble may be visible inside the glass. This is not a defect. Each Flute is Hand Blown and then Hand Painted in a stunning array of Translucent Green & Blue with a string of Gold dribbled all over the outside. Hand Blown Romanian Crystal. The base of the piece is colored Translucent Green, fading into a Translucent Blue, before fading into Pure Clear Crystal. I did not find much about this glassware. What I did find was on the web. After much research I'm sure the pattern is correct. I have two sizes in this pattern listed. Beautiful clear ball stem Claudia. I found this pattern in Import Assoc as well. This set of stemware has not gold trim. I have many lots of bar ware listed. I need to close 3 estates. There is almost always a solution. It truly is a beautiful piece, would look better if my fingerprints weren't all over it. 7" tall x 5" across the mouth x 3" across the base. Stunning Cut Crystal Bud/Flower Vase USD 16.00. Exceptional Yellow Flower Glass Eye With Attached Stand Art Glass Paperweight USD 40.00. For sale is a 24 pieces Riekes Crisa Hand Blown Crystal Moderno Punch Bowl Set with Ladle. Great for weddings & parties. 13 1/2" long. Martini glass. Set of four. These glasses have a very unusual shape. 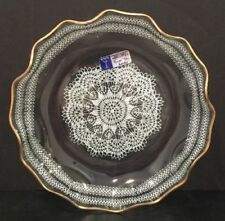 Manufactured by Rosenthal in the Iris pattern. Signed Rosenthal Studio Line. Signed with both paper sticker and acid backstamp on the bases that reads Rosenthal with crown Studio Line. "Iris" Frosted Stem. Tritan Crystal Glass: Non-Lead Material of Titanium and Zirconium Oxide; Resists Breakage, Chipping, Scratching; Thermal Shock Resistant; Patented. I am a dedicated picker! Height: 10 in. Juliet cut double old fashioned glass by Rogaska. In excellent condition, except for one has a chip on the rim, see photos. Blown Glass. Piece Code: DOLD. CLEAR WITH PAINTED PINK/WHITE ANEMONE FLOWERS AND GREEN VINE/LEAVES WITH GOLD LINES. HEAVY CRYSTAL VASE. ELEGANT SLEEK MODERN OVAL DESIGN. 2" THICK BASE ~ BEVELED RIM. Beautiful clear ball stem Claudia. I found this pattern in Import Assoc as well. I have many lots of bar ware listed. I need to close 3 estates. This set of stemware has not gold trim. There is almost always a solution. They are 24% lead crystal and were made in Italy. I believe they were discontinued in 2009. All the glasses are in excellent pre-owned condition. No surface issues. The glasses were hardly used. They do need to be cleaned. I am a dedicated picker! Heavy and solid, no easily visible scratches that I could find. doesnt look cloudy in real life. its bright, brilliant, clear and sparkly. Majestic Gifts Crystal Hand Cut Mouth Blown Fully Leaded Footed Bud Vase, 8"